Factory service manual for the Nissan Pathfinder R51 series vehicles built between 2005 and 2012. Covers all aspects of vehicle repair, maintenance and rebuild specifications for all mechanical components, including engine, gearbox, differential, front axle, along with repair and replacement guidelines for suspension, steering, brakes, body panels, interior fittings, electrical components. Also covers electrical system with wiring diagrams and diagnostic data, plus troubleshooting guides. In August 2003, Nissan unveiled Dunehawk Concept and showcased it at the IAA 2003 in Frankfurt (R51 design patents filed 8 September 2003), previewing the next Pathfinder's design. At the 2004 North American International Auto Show, Nissan unveiled a completely redesigned Pathfinder for the 2005 model year. The new R51 Pathfinder uses the Nissan F-Alpha platform, thus returning to a body on frame construction. It is powered by a 4.0 L V6 engine VQ40DE (266 hp (198 kW), 288 lb⋅ft (390 N⋅m)) or a 2.5 L YD25DDTi (126 kW (171 PS; 169 hp), 403 N⋅m (297 lb⋅ft)) Turbo Diesel. 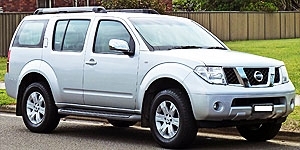 The larger Pathfinder Armada debuted in late 2004, but was based on the Titan full-sized pickup truck and dropped the "Pathfinder" prefix in 2005. The Pathfinder is sold as the Terrano in many markets outside of North America. In 2013, when the redesigned Pathfinder was released the Pathfinder name became international as it sold worldwide. These were the first to be sold in the UK. The 2005 model introduced a third row of seats to the Pathfinder line for the first time.